Die Form is a form of Sora's in Kingdom Hearts II. Sora is transformed into a six-sided die against his will when he loses against the Gambler's or Luxord's "Stop Dice" and "Begin Game" reaction commands and when he begins the battle against Luxord. While in Die Form, Sora balances on one corner of the die, unable to move normally. Sora moves and attacks in this form by jumping, which has the added effect of rolling him. Although Die Form consumes two bars of the Drive Gauge while in use, the gauge is refilled after the form expires, even if Sora was in a Drive Form when he was transformed. If the Drive Gauge is disabled when Sora is transformed into a die, he will immediately revert to his normal form, and he cannot be transformed while performing a summon. Constantly jumping in this form can be used to delay Sora turning back to normal. Additionally, Sora cannot enter and exit rooms on his own in this form; he must instead be pushed through doorways by some means. 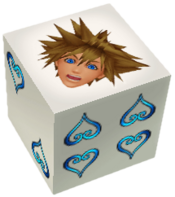 In Die Form, Sora takes the form of a large, six-sided die. An image of Sora's head represents the number one on the die. Sora's face is frozen in an expression of shock and surprise. Everything from Sora's neck down is not visible in this form, including his crown necklace. The other sides of the die are numbered with several elegant, curled, cyan hearts, all of which are identical in shape to the heart in the background of the Kingdom Hearts logo. A sprite of Sora's Die Form.